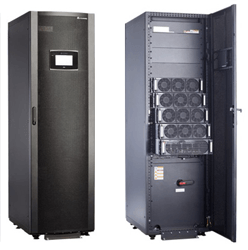 True modular uninterruptible power supplies (UPS) are fast becoming the UPS technology of choice for small, medium and even large-scale datacentres. This is due to advances in UPS power module design, miniaturisation and operating efficiency. Most modular UPS systems comprise of power modules that range from 20-40kW. The power modules are typically Unity Power Factor rated; whereby the kW rating matches the kVA rating. Most modular UPS systems use power modules with a height of between 3-4U and can be scaled up to 1MVA. In the future modules as powerful as 100kW/kVA in 2-3U height sizes are expected. Traditional mono-block UPS systems can be run in parallel configurations to give N+X redundancy or capacity systems. Parallel UPS systems can therefore be considered to be ‘modular’. They are based on standalone mono-block UPS systems with parallel-connected outputs and inter-module communications cables. True modular UPS systems rely on slide-in power modules trays. These UPS modules are similar to typical 19inch rack mount cabinet hardware except that they have to be housed (slide-in) to a modular UPS frame. The frame provides central power connections (input/output) and also houses a power control module, remote communications, overall system static switch and maintenance bypass. All the internal infrastructure sits behind a hinged front door housing a central display (touchscreen or with a keypad). An example of this would be a 120kW modular UPS frame that can house up to three 40kW power modules. The UPS system can be configured as a 120kW systems, 80kW (N+1), 40kW (N+2) or even a 40kW system using just one UPS power module. The modular UPS system frame has a standard footprint and scales vertically. The use of this type of UPS system therefore helps to optimise floor space within a datacentre. The system is also designed to draw air in from the front-bottom area and expel through its roof, allowing the rear of the modular UPS frame to be placed against a wall and in-row with other server cabinets. Right-sizing the UPS module number to match the current and expected load also helps to optimise the overall budget spend. Provided the supporting electrical switchgear is sized for future expansion the system can be expanded at a later date to meet future expansion with the addition of another UPS power module. The process for adding a new power module is straightforward. In a typical modular UPS system it just takes the turning of two locks to allow a module to be released or locked into position. Once removed or installed, the system will normally alarm until the system parameter for UPS modular number and size is adjusted to suit the new configuration. Security and resilience are key features of any UPS system. As with a mono-block uninterruptible power supply, a newly installed power module must be tested before it is brought on-line. In a modular system, the new UPS power module will activate once it is connected to the UPS frame. Most UPS power modules will run through around 400 internal self-tests before they either indicate a green light or sound an alarm. Only then will breakers close to being the power module into circuit. As well as right-sizing the UPS capacity in terms of kW/kVA, the battery can also be right-sized to achieve the desired runtime. A modular UPS system will share an internal battery and will also typically run on a variable DC voltage rail. This allows individual battery blocks to be removed or added to the battery string due to failures identified during battery testing or maintenance or the desire to increase the overall runtime. Modular UPS systems also help to reduce overall service times and maintenance costs. The UPS modules are standardized and can be used in any similar brand system. Not only does this simplify logistics and stock holding, the modules are designed for installation by any competent technician or operator. No specialist skills or test gear are required. The fast way power modules can be removed and installed also reduces the time service engineers have to spend on site. The only common elements to each power module are within the UPS frame itself. As a final consideration overall operating efficiency can also be greater with a modular UPS system leading to lower operating costs from less energy wastage. The typical UPS module has an operating efficiency of 96% and this can be achieved over a wide operating load range from less than 20 to more than 80%. This is important within a datacentre responding to changing loads and therefore ever changing server utilization and loading. Modular UPS systems may have a price premium over traditional mono-block uninterruptible power supplies but the advantages in terms of energy saving, usability and overall Total Cost of Ownership (TCO) more than compensate over the lifetime of the installation. For more information view Modular UPS Systems on our YouTube channel or contact our projects team.